looks like every new file gets trojan.gen.8 . Bored to have ams.exe, acs.exe and other safe executable files in quarantine. This heuristic analysis for Trojan gen.8 have to be quickly settled, else Norton is replaced by another security tool in the next months on my PC. Never had problem with acs.exe until the latest update .... it happened yesterday with this executable file after many months in my hard drive. If I don't see it ... I'll have for hours verifying files with Steam to get it back. There must be a difference made between something like a Trojan and a real Trojan. !!!!!!!!! I read that Reiza already contacted Symantec for this problem ... and nothing's changed. Sorry to be rude ....but nowadays only this way of reacting is the only solution to have an answer and afterwards a move to solve such problems. NB 2: meanwhile, my only solution is to disable the heuristic analysis. Surely less secure than another better correction by Symantec, isn't it ? Let me know please so I can follow up on this.. Thanks for reporting this issue, @hamsterbryan, @Blanchy Jean-Pierre, @dr_cbr. We are looking into this now. Could you confirm your Norton product version number? I just started the PC, did have a big Norton update, restarted as asked and enabled the heuristic analysis again and checked manually the 3 exe which were mainly suspected .... and they were confirmed as safe. Is it fully corrected ? .... we'll see in the next days ... as it mostly happened just after an update of those exe files. But it also happened sometimes for older exe files which were considered as safe for a long time. I'm leaving the heuristic analysis enabled ( Automatic mode ) .... and will see with the next update of those exe when they'll come and if they come of course. I can't tell more immediately. Anyway, thanks for having a look at the problem and trying ( or succeeding maybe ) to solve it. While we look into this issue, could you please submit few files that were flagged in the below form? Please let me know the submission reference number. I noticed this pop up for me yesterday but thought nothing of it. Today I tried to play Rocket League from Steam and it popped up again and the game wouldn't start. Same thing happened over and over again. Do I have to disable Norton because of this? Very annoying. Hope it's fixed soon. While you are playing Rocket League, do you put the game and Steam into User Specified Programs under Quiet Mode? Once you finish playing, then Norton will catch up. I had to turn off norton and then change the .exe from Rocket League to trusted. It works fine now but it should never have been an issue to begin with. I don't pay yearly to have to mess about with files manually changing them. Most games ( as it seems the problem happens mostly with game softwares ) are constantly updated nowadays and if this update includes a new exe .... it looks like this new exe ( with the same name and maybe not the same ID ??? as I have not enough informatic knowledge ) is not excluded any longer for the analysis and the Trojan Gen8 is once again detected. Now the question is also: why are those exe detected as a possible Trojan ? ...because they include something like a "check version" or a "check version for update" or "check your PC specs" or something like that ? Finding the reason why it happens is finally the main info needed for Symantec to solve the problem for good. Has anyone done what Mohan asked you to do? You get an email back almost immediately with a reference number? to take them out of quarantaine so i can sent them in. i am not going to do that over and over again. i am even happy to contact support and to let them take over an extract the files them self. But for the moment, those exe files were restored and excluded of the analysis .... so they appear clean when analysed. Now it'll be difficult to know if the problem happens when downloading or installing ... as mostly from Steam now an update is downloaded partially, installed partially on disk .... sometimes a few time after one another if the files to download are rather big. 1) a few files ( present on PC since a few months ) were quarantined ... suddenly when working on PC ( or just after an absence from the PC ... with maybe a quick analysis done ). ....I had to delete the whole folder. Now not knowing if this is a real Trojan or not .... I'm not taking the risk ... but if is well a false detection, then why use an Anti-Virus software if it doesn't know if it is a virus or not ! Type de menace : Virus heuristique. Détection d´une menace en fonction d´heuristiques de logiciels malveillants. Des centaines d’utilisateurs de la communauté Norton ont utilisé ce fichier. Ce fichier a été publié il y a 2 mois . Ce fichier présente un risque élevé. I'm having problems with this false positive. It has just deleted an executable file from a game I play, which means I have had to uninstall the whole game and download it again. I'm concerned this is going to happen again (there seems to be no way to prevent it). I am wasting a lot of time with this. Can anyone please help? If you scroll up, you will see that Mohan posted in this thread on 2/9/17. He is a Symantec Employee. They are working on the issue and he asked that the files be sent in to Symantec using the False Positive link which he gave. Thanks for your reply floplot. I really have an issue as I can now no longer download and install the game from Steam. After downloading 2.3GB (yes that takes some time on my connection), the game fails to launch with an error message ''content file locked''. I am at a loss how to resolve this - Norton seems to have done something which is now preventing the game downloading and installing properly. I have now wasted 4 hours trying to rectify this, and I can no longer play my favourite game on my PC. Until a week ago I had Macaffee with no issues. Curiously, in the details of this quarantine ... the exe of another game was included: ams.exe causing generally the same False Positive. ams.exe is Automobilista by Reiza based on an older Rfactor game. If needed I may later do a new submission for this one apart. Now, how submit the reference numbers ? ... here publicly or in a personal message to Mohan ? I'm saving the 2 received mails in the meantime. NB: please note the button "close" after submission doesn't work with Chrome browser. For the Fanaleds, already received Symantec's answer: "the detection(s) for the following file(s) will be removed from our products:"
False Positive responses usually come within 24 hours.. You can post a FP reference number in the Forum. One of the Gurus would probably notice it and can get an answer. I know I can ask around if any of the Admins are around. Hello and thanks for your answer Floplot. I just got an answer for the 2nd one "Rfactor2" .... of course safe will be whitelisted "soon". I'll do the same in the afternoon ( Belgian time of course ) for ams.exe ( the one which was restored 1 or 2 weeks ago ) in the same purpose. Is it the digital signature whitelisted as I suppose it is ? In case of a new .exe file included in a game update ... ( more or less regularly ) ... what will happen ? Do these modified .exe have the same digital signature or a new one ? In the 2nd case .... the false positive detection might happen again. Am I right or wrong ? So a whitelisting of a digital signature will not be enough, but only a much deeper solution is urgently necessary. In both cases I received this response: Upon further analysis and investigation we have verified your submission and, as such, the detection(s) for the following file(s) will be removed from our products. Norton how ever still detects the Authinticator file as a Trohan.gen.8 and removes it. Please submit it to www.virustotal.com and see what they say. So, what does this mean ... a 9% chance that this is a malicious file? Norton anti virus has again removed this file from my computer. It shows that Norton agrees with Virus Total that it is malicious. You can try sending it to Symantec as a False Positive and see what they say when testing the file. You can try Customer Support and see what they say about it. The antivirus result displays a green circle with a white tick mark, what does this mean? I get the same problem as you guys. The Norton Anti-virus alarms me that I have a Trojan virus (Trojan.Gen.8) and blocks it then my MSI Live Update 6 ask me for a live update. The Norton Anti-virus also Blocks the .exe files from Windows\system32 locations. To handle this my Norton wants to restart the computer. I guess this is a bugg or just a glitch from Norton ?? Should I be worried or not? 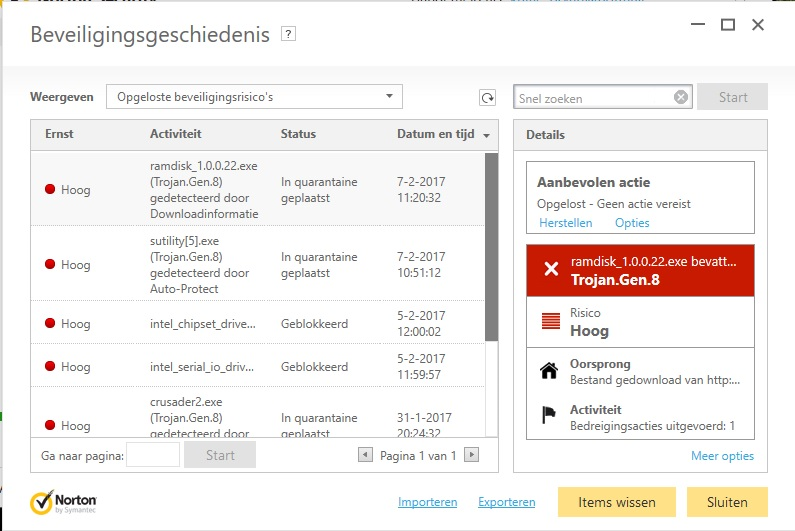 is this a Trojan virus? From MSI I doubt it. You can send in the files to Symantec so they can be further analyzed as a False Positive. I've reported this thread to Norton Employee Mohan who has posted here a couple of times in this thread. I agree that this should not be happening to such a large company as MSI since they do deal with computer parts and computers. You are supposed to get your files from MSI if you have MSI products. Forget about getting them through Windows Updates. In relation to submission 19902. In relation to submission 20133. Thank you for submitting the files. The team is looking into it and I'll keep you posted. In relation to submission 20229. Sorry to come again and once again with problems ... but more and better is to be quickly done for your heuristic analysis !! I had today a big update Automobilista ( Reiza Studios ) with Steam .... the main exe ( ams.exe ) was detected as Trojan Gen 8 but worse than before ... in place to be put in the quarantine, it was purely and quickly deleted and no possible action to restore it. I usually remain polite and gentleman ..... but I'm not sure of my further reactions. Please do something better to make a difference between a Trojan Gen 8 and something acting like it. Now I'm forced to check 1.9 GB with Steam to get this exe back ! I don't see why game editors or MSI or other ones surely to come ( Microsoft maybe ??? ) should be stupid enough to have Trojan in their softwares !!! Impossible to send you now a report as I haven't this exe any longer on this PC. I'll disable the heuristic analysis and get it back .... sure I'll send it to you as false positive ... but what's the importance of this if the problem begins again and again with next updates ! File ams.exe back on PC after verifying game cache in Steam and restored because this time it was put in quarantine. False Positive detection submission done. If false positive, I hope the next .exe update will not be a new same detection. NB: unprecise submission cause as it may be download or install or maybe also analysis afterwards. yes i am over 10 yaers a Norton user never had real problems. now its on so many exes from msi / steam games . ath every update zo this must be a problem on nortons side . and i cant believe we need to send al those files from such a big companies to them every time they update something. so get your stuf together en fix your program ;) it is not that the false exes come from smal unknown develepers . Of course ... the ams.exe of Reiza Automobilista was a ... false positive. Problem is .... what will happen with the next update ? .... I don't know !.... hoping it'll be perfectly whitelisted for the future, but I still have doubts for it. It looks like every one has to submit their files 1 by 1 to False-Positive to find out if it is safe to use their file and safe to download it. These files are in the MSI Control Center program that is associated with my computer's motherboard. My computer is virus-free as I have re-installed the original software package that came with it on CDs. I think this is a "False Positive." Please see my posts above for instructions on how to submit files for false positive analysis. Once again a .exe deleted from my PC and not put in quarantine. Impossible to restore it. After getting it back with a Steam files check ( a chance I have a very good internet connection ), I checked this same file at Virustotal .... and even Symantec is OK ( green ). So I don't know why it was suddenly deleted ! This is the last time I'm noticing such a problem... next time, Norton is out of my PC for life !!! Reason why I'm not gonna submit anything. I have Norton to protect me .... not for bothering me. We are not your paying beta testers. Sorry but if you cannot see a difference between a real Trojan Gen8 and a false detection ... stop analyzing that way. I will not come back into this thread for a new comment ... and if it happens just once more, Norton is out and I will surely never advise people to use Norton in the future. Symantec customer for Norton for so many years ... but sorry I'm fed up with these working ways. I understand your frustration, but if everyone felt that way, Norton would never know about new malware or new false positives. Find why an executive file of a software may be considered as Trojan Gen8 .... while in fact that's not one ! Maybe it acts or looks like one ... but isn't. Third problem: why was this exe purely and simply deleted and not put in quarantine, as it is mostly the case ?? Fourth problem: why have a Security software if it even doesn't know what is the difference between a virus or a trojan and ... simply something looking like it but not a real one .... Do we have to decide on our own ?? .... then rather a free Security system ... than pay for something which is unable to know what to do ... even erase something because it's looking like ! ??? Mostly now, I let VirusTotal analyse the file and find only 5 Security systems are considering this file is a Trojan Gen 8 or other name .... while so many other ones consider it ...safe. Please quickly find a solution ... else Norton will loose many more customers than even before ! I'm someone cautious but this program might make me incautious due to such false positives. NB: sorry to be harsh ... but I'm now aware that nowadays it's the only way to make people react and find solutions to a problem. More and more the customer is the tester for products which are not perfectly tested ! Big commercial error in my own opinion and maybe old fashioned way of analysing some modern and bad working ways. NB2 my native language is french .... so sorry for some approximative sentences in this long comment. If each time a exe is modified with a new version ( and it may sometimes happen more than once a month ) and each time this exe is brought in quarantine, that we have to restore it and we must ask to declare it for the same known editor as false positive .... I really don't need such a stupid Anti-Virus system or unable informaticians to find a more intelligent system. Bad politics, bad reasoning and bad action to do as ... we don't know how to make the difference between a real Trojan and a false one .... so... let's always declare it as Trojan Gen8. What happens, what's the customer's reaction:... Norton is not reliable any longer. Be sure that all who wrote in this thread are lost customers and surely many more who do not express themselves. URGENT to find a solution. Are the 55 on 62 systems idiots to declare it negative instead of false positive ???? 55 green circle with white tick indicates File not detected in any way. VirusTotal makes use of the symbol to indicate that the given file was not detected in any way by the antivirus under consideration. We do not use the word "clean" or "innocuous" because antivirus solutions do not tell you whether a file is goodware, they just flag maliciousness. VirusTotal antivirus solutions sometimes are not exactly the same as the public commercial versions. Very often, antivirus companies parametrize their engines specifically for VirusTotal (stronger heuristics, cloud interaction, inclusion of beta signatures, etc.). Therefore, sometimes the antivirus solution in VirusTotal will not behave exactly the same as the equivalent public commercial version of the given product. VirusTotal is not a substitute for any antivirus/security software installed in a PC, since it only scans individual files/URLs on demand. It does not offer permanent protection for users' systems either. At VirusTotal we think of our service as a second opinion regarding the maliciousness of your files/URLs. Although the detection ratio achieved by the use of multiple antivirus engines/URL scanners is far superior than that offered by just one product, these results DO NOT guarantee the harmlessness of a file/URL. Moreover, the aggregate amount of false positives of multiple solutions is higher than that of any individual scanner. Currently, there is no solution that offers 100% effectiveness in detecting viruses, malware and malicious URLs. You may become a victim of deceitful advertising, if you buy such a product under those premises. FWIW: some of the 62 engines in your example may use the same criteria against this sample (so, for example 7 red may be 1 red) YMMV. no comment Re: trojan.gen.8 /false? The real problem of this kind of analysis is .... too many false positives and moreover repetitive ones for the same software editor exe file which already was proven as ... false positive. So how can we trust something saying it's a Trojan Gen8 ... if finally it is .... not ! I'm no hacker or virus maker ... but if I was one I'd know how to jeopardize Norton's users ! That's precisely what happens here. Surely totally free or stolen software exe contains real Trojan Gen8 ... but I doubt a serious software maker ( game or other ) might take the risk to publish such an executable ... making his reputation so bad that it might mean his own death. I think Symantec should make exceptions for those legal software makers distributed by serious and earnest platforms rather than the actual ridiculous and finally dangerous way of working. Maybe that's the difference between 6 or 7 softwares detecting Trojan Gen 8 or other names ... while all others don't detect them as they already noticed it was unuseful ... as the difference between a real Trojan and a false positive can't be found with precision.